Serenity Now: Thrifty Treasures: Free Fabric, and Fleurs, and Wicker-Oh My! Thrifty Treasures: Free Fabric, and Fleurs, and Wicker-Oh My! Please be sure to "vote" at the end of my post today! 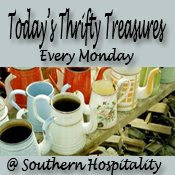 And when you're tired of me here, run over to see Rhoda at Southern Hospitality for more fabulous finds! I was not planning on yard saling this weekend. The girls and I went out on Saturday morning to find a birthday present for a two year old boy (try explaining to a three year old girl why you can't buy a pink My Little Pony card for a little boy who's having a monster truck party!). On our way home we saw that a couple of houses up the street were having a yard sale, so of course we dropped by! I found not one, but two of these neat wicker platters. I'm planning on spray painting them (white?) and somehow incorporating them into my sister's wedding shower and/or entertaining on our new deck (crossing my fingers that T sticks to his guns and builds the darn thing next weekend!). Grabbed seven (that's all they had!) wicker paper plate holders for $1 total. Should I spray paint them white as well, or leave 'em natural? The holders themselves will not touch food...you insert the paper plate inside. These will be fun when we have family over to eat outside! I found this hardbound copy of Gourmet's Parties for just fifty cents! I saw it on Amazon for anywhere from $25.00 to $0.01....but you still have to pay like $3 in shipping, so my fifty cents is a bargain! Great recipes and tips inside! Also snatched up this cute little apothecary (love them!!) for fifty cents. This one is going on my bathroom to hold Q-tips or cotton balls. They had a bin of fabric for FREE! I love free. The yellow was actually marked at seventy-five cents, but the lady gave it to me. I snatched the yellow because Michaela Byrd's room has some yellow accents in the window treatments, and I thought I could practice my sewing and make a little pillow or two. It's a lot of fabric! I just really liked this fabric with the cute little chairs on it. The green is actually pretty bright, and the blue and purple will also match up with Michaela Byrd's room! 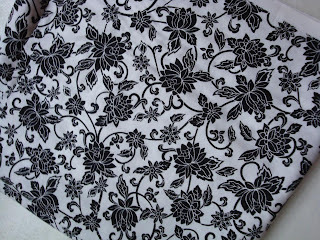 This metal fleur de lis was marked down 70% at Joann Fabric today. I got it with a gift card for only $9.00. I bought it with a mind to hang it somewhere outside, but I may just hang it on the wall of uninspiration in the addition. It would be surrounded by black frames with old black and white family photos. It's pretty blank, huh? Somehow the Fisher Price Loving Family Dollhouses just don't add the ambiance to the wall that I was looking for. Finally, I'm not even gonna tell you how long this print was sitting behind our headboard in our room. I bought it ages and ages ago before I knew what I liked. I think the photos (upside down, I know!) are pretty, but I don't like the way the poster has the photos grouped. I have plans to spray paint it, fit some cork inside the frame, and cover that with the fabric pictured (50% coupon at JoAnn!) below to make my own fancy note board, but I can't decide on white or black for the frame! It's going over near my infamous $8 Salvation Army makeover table. (See below for a photo) I just got a white shelf to go over the table, but all of the frames in the room are black. P.S. If you missed my Price My Space post please check it out! You scored some great stuff and you can't beat free! Those platters look wonderful and i adore the metal fleur de lis. I vote for black frames, I think they would look very striking against that wall. Love what you did with the table skirt, it looks good! Some great finds! Of course, free fabric is always a winner. I really enjoyed reading about the SA table! What a transformation! Great job ... thanks for sharing! I would go with black, especially if it is on a cream or light colored wall. Depending on your accents, you could even do a color to make it pop- red, or the right shade of green. I would paint the frame black. Either color will look good with that pretty fabric, but black is my vote. I love the fabrics that you got for free. It looks like the yellow coordinates with that cute chair fabric. You found some good stuff this week! I think black is the right choice! Way to go on the free fabric! I love that fabric with the chairs on it...so cute! 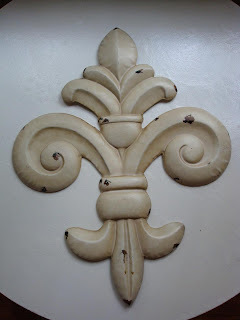 And that fleur de lis I would have grabbed for my daughter's room. I like what you are going to do with that frame, and I vote black because, as you said, there is all that white in that fabric. 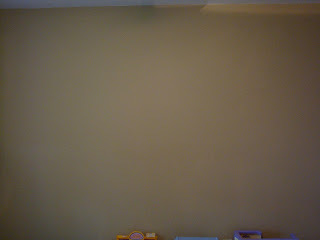 It will just pop on that wall if painted black! Oh, yes, def. paint the frame black....it's gonna knock your socks off! And I LOVE the fleur de lis and the chair fabric!! Definitely black for the frame for maximum contrast against the wall. I have to confess that I hate yardsales (having them OR going to them), but kudos to you for your awesome finds. Nothing beats free, when it's something you'll use! Great finds! I'd paint the frames black but then the next week, I'd paint them red or pink or white so don't take my advice. I've painted one little shelf 4 times this year. You are quite the gifted shopper! Great finds! I'd go with black, but I love black frames. Love your finds! I vote for black frames! Love your blog! Loved that little chair fabric! So cute! Thanks for stopping by! Free fabric is AWESOME! I'd go with black as well. Im lovin' that fluer you got there! Amanda, you found some great things. Love the fleur & that table skirt is gorgeous. I want to see the black and white thing when you finish it! I saw that same fabric at JoAnn's! I love it! Stopping by from SITS to say Hiya! I love your finds.....I would go with a black frame... Everything you got was great ! Definitely black for the frame, because the "accents" are what is black on the fabric, and the background's white. If it were reversed, I would say white for the frame. Nice fabric you have chose from Joann Fabrics... Other stuff also looking pretty! !